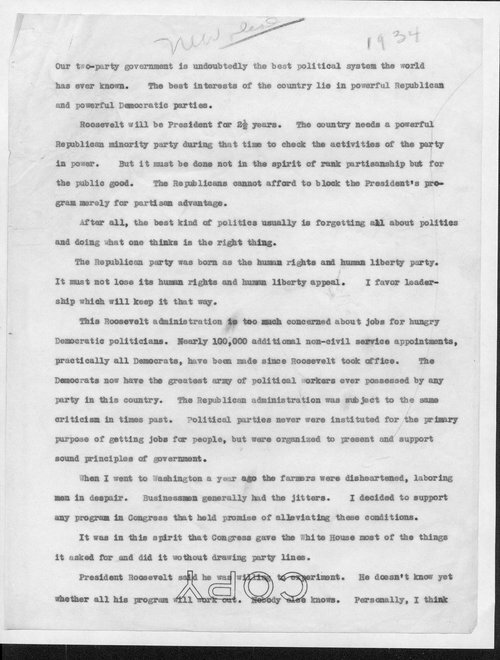 This draft of a speech by Senator Arthur Capper contains his views on President Franklin Roosevelt's New Deal. In the draft, Capper insists that the Republican Party must serve as a check and a balance against the Democratic Party. However, he clearly states that "the Republicans cannot afford to block the President's program merely for partisan advantage." In Capper's view, the Republican Party must carefully observe what is going on with the various New Deal agencies, and actively work to ensure that the good of the American people is at the heart of everything that is done by the U.S. Government. This item can be used along with other items on the WPA and the Kansas Landscape to provide students with some insight into the often contentious debate that surrounded the WPA and other New Deal programs.